HRBSE-106 | Size: 30 ml / 1 fl.oz. An intensive serum that supports fast, natural regeneration and restoration of damaged skin. 99% Garden Snail Extract, chemical-free formula. The remarcable repairing action upon affected (deformed) tissues is given by the unique composition of the active principles: chains of glicoconjugated molecules with proteins, peptides, enzymes, co-enzymes, oligoelements. In contact with skin they recognize imperfect or dead cells, replacing them with new healthy ones, the same way the Snail repairs its own tissue. Removes dead cells (natural peeling) increasing cellular oxygenation and regeneration. Unifies the color of the complexion and eliminates brown spots increasing skin luminosity. Normalizes the sebum secretions, restoring the moisture-lipid balance of the skin. Calms and repair irritated areas affected by the sun exposure, shaving or depilation having a regenerant and antioxidant effect upon skin. Moisturizes, helps in wrinkle prevention, while stimulating the secretion of collagen and elastin. 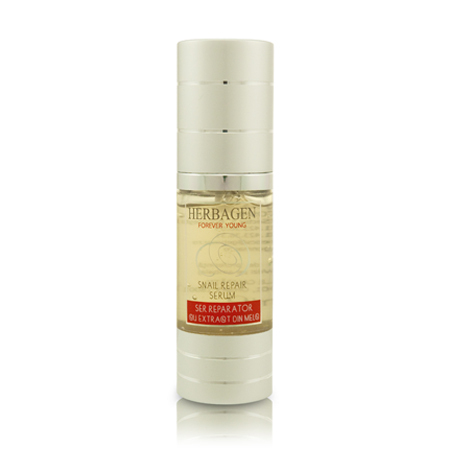 Can be used together with other products from the Herbagen Snail Extract Line adequate to your skin type. INGREDIENTS: HELIX ASPERSA SECRETION/POLYHELIXAN, 2AMINO-2METHYL-1PROPANOL, CARBOMER, PHENOXYETHANOL, ETHYLHEXYLGLYCERIN. Poly-Helixan - A powerful active, natural and ecologic ingredient , obtained from the garden snail secretion. A rich, delicate, but effective cleansing lotion. I have been using this serum for almost 2 years. It has improved my skin dramatically. I had sunspots which are considerably diminished and my skin has no wrinkles. Really like the serum. With continued use much improvement! Excelente producto al 2do. dia se ven cambios positivos, recomendable.